Try out some easy to do personalized wrapping paper this festive season. Using simple inexpensive brown wrapping paper is great for customizing but also cuts down on the amount of rolls you have to buy. (Also great for year round wrapping needs!) Another idea is to be eco conscious and try using things you have at home like craft paper, newspaper, or even brown paper shopping bags. This recipe is easy to follow but learn from my mistakes and take your time. My first couple batches were a big fail 👎🏻. •Slowly mix in your water and specifically use lukewarm water. •Start baking your salt dough at a low temperature and work your way up over time. I tried to bake mine too quick and they started raising or bubbling up. Set aside 4-5 hours for this project. •After painting and decorating, don’t forget to seal your ornaments with a lacquer or sealer. This will help your ornaments last longer. Affordable Fun & Easy gift ideas for neighbors, friends, family. Looking for a special homemade gift this season? Try out this easy recipe for salt dough ornaments. Your kids will love decorating them and grandparents love receiving special memories of a babies footprint or handprint. Easy, affordable ways to customize a gift for the people you care about! 1: Coffee Capsule Advent Calendar: this can also be for tea or candy lovers. 3: 12 Days of Alcohol 🍷🍾🍺🍸: Great way to curate your friend’s favorite alcohol. 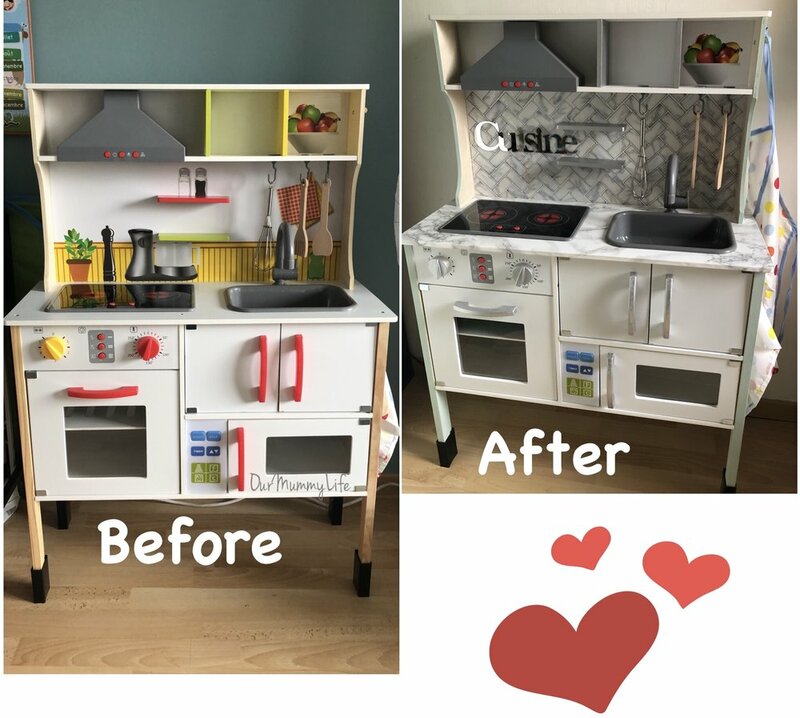 Check out the simple and easy way I turned a stock LIDL kids kitchen into a chic area of imagination HERE! Check out some of these easy to do and fun crafts/deco using food and nature. Need a last minute EASY gift idea for that special teacher?? 1.Handprint flower card. Many teachers just want a simple sentimental handmade gift. A little paint and markers and you’re set! ** You can also apply this phrase to a potted plant for a gift. 2.Popcorn and a movie gift card. Summer is here and so are some really great new movie releases. Treat your teacher with a chance to relax at the movies. 3.Fancy teas is another way to help your teacher relax after a long year of rambunctious kids. You can also swap this out for a Starbucks gift card with the phrase “Thanks a latte for all that you do”. 4.Lightbulb container filled with candy. This idea takes a bit of searching for the container (I found mine for cheap at a local shop but others can be bought on Amazon). 5.At home cookie mix. Know Amy teachers with a sweet tooth? Who doesn’t love easy ready to make fresh cookies?????? All you need is some sturdy paper, paint, and markers. a fun inexpensive way to make a floating race track! Check out these simple and fun craft decorations for Easter. Dying Easter eggs can be messy...so why not try these craft alternatives like painting with cotton balls or a wine cork. Also try stamping with a potato (Adults required) or an empty toilet paper roll. DIY frame - to display your kids art! slimy fun for the whole family! A felt Christmas tree with decorations are great for toddlers. Helps keep them away from the real deal Tree. Super easy to make! All you need is some colored felt, scissors, glue for the decorations, and tape/command strips to hang tree. The use of clothespins is great for working on fine motor skills. Make it fun by adding in colors, shapes, and numbers. Try using discarded cardboard from cereal boxes or other containers. Color and number several clothespins. Then, cut out different cardboard shapes. Use each shape for different ideas like matching colors and numbers, counting circles, or matching colors with fruit. If your child loves playing with cars, then they will love this craft! Color with cars is a great way to add a layer of learning and fun to an already cool activity. Find some of your child's favorite toy cars and tape a marker or crayon to the back. Lay a large piece of paper on the floor or table top. Encourage your child to draw shapes or have a fun race! Here is different way to play with the always popular finger paint! Cover a small rolling pin in plastic wrap, then add any texture you prefer or have available. I used string first, then transportation stencils. Other great options are thick stickers, rubber bands, or bubble wrap. After the pin is covered, let child paint the pin or you can pour the paint in a shallow dish for dipping. Then, let the good times ROLL!! Straws, light weight paper, crayons, scissors, and tape. Cut paper into 2" by 4" strips. Roll paper longways around straw and tape. Fold the top of the paper tube down and tape. Put paper tube on straw and blow! Here is a fun way to change up your every day bubble play! *Cut small plastic bottle in half. Try to make the edge even and flat with the surface. *Take the end with the spout and dip in a dish with bubble solution. *Blow out of spout to get bigger than life bubbles! This fun craft/activity is great for little ones who love rockets or watching any vehicle go zoooooom! Easy to set up and endless amounts of fun. I tied the fishing line to the first chair, then added the cut straw and finished by tying the string to the second chair. Pull the two chairs apart so that the line is tight. Blow up your balloon and hold the end shut. Ask your wonderful assistant for tape and attach the balloon to the straw. Ask your wonderful assistant again for a dramatic count down and release the balloon. Watch your rocket balloon go ZOOOOOOM! Repeat as many times as you want. Upcycling is so much fun! My son loves car's so I immediately thought....... car garage! •Lay box on its large side and cut the top off. I left a 2 inch border. •Paint the box with your choice of colors. •Glue ramp at the top and bottom. •Cut paper towel roll into 3 pieces. •Use 2 pieces of the roll and glue onto the triangle cardboard piece, then glue onto top of box. •Once paint is dry, use a white out pen to draw the parking spaces, numbers, road, and welcome sign. •For additional aesthetics, add colored Washi tape to the outside. It's that time of year again, Back to school!!!! Many have already headed back, but next week will be the beginning for most of us in France. Have fun with your little one and try doing these fun crafts in preparation for the start of school. Great for first day of school photo or their handprint. Also possible to write down a couple of fun facts like favorite color or what they are most excited for. Iconic symbol for going back to school. Have fun going over shapes like circles and squares. Let the child place where they want the shapes. Teach your child the name of their new school by writing on the bus. Also possible to add photos to the windows on the bus. Simply have FUN! Great opportunity to go over good behaviors and how to have fun with their new friends. Great for preparing your child for a new environment, if this is their first year at school. Wising everyone a HAPPY Back To School!!!! Father's Day Tie Card 👔 Here is an easy Father's Day craft idea for anyone struggling with last minute gift ideas. Materials Needed: Construction Paper (2) Scissors Tape Glue or double sided tape *Fold first piece of colored paper in half. Open and cut about 1inch off the top right side. Halloween is just around the corner👻. * Cut out a ghost shape from construction paper. Apply cotton balls with glue to the entire ghost shape. Finish with a happy or spooky face. * Cut out a candy corn shape (triangle) from construction paper. Tear tiny pieces of colored (yellow, orange, white) paper. Apply glue and colored paper one stripe at a time. Finish with writing your name or make multiples and string them together. * Apply black washable paint to the palm of your hand. Press hand on white piece of paper or paper plate. Reapply paint and press hand opposite of the first hand print. Color in the center of Spider. * Apply white washable paint to the palm of hand and part of wrist. Press hand/wrist to black poster board or construction paper. Finish by glueing cotton swaps (qtips) on to your handprint.